…good for you? Are you ready or are you freaking out? One of my colleagues today mentioned that he had to sit through four different birth movies. 4! That is the same number of Scream movies BTW! Are you the dad-to-be? Want to only read a chapter a week? Feel you might be lazy and skip a week? This is the book for you. I loved it because it tells you week by week what to expect from your wife and your baby. I found it pretty spot on. If there was something changing in the baby or they started to sleep differently, this book helped me understand why. Your kid is going to understand you long before they can talk to you. 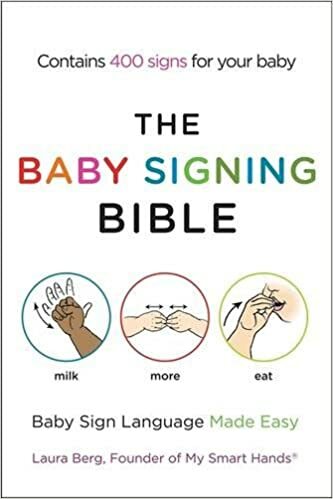 That is where baby signs come in. Think of the easy ones like “bye-bye” and “peek-a-boo.” These signs allow you to communicate with the kid. With my first child, we got up to greater than 60 signs. By the end we were signing words like peaches just because we could. When your child starts letting you know they have a diaper, or they are hungry, you will be glad you did this book. There is no wrong way to do it. If you can repeat the sign every time you say the word, then your kid will pick it up quickly. So here is the crackpot one. There is this Australian lady that identified 5 sounds that babies make. Ne-Ne means they are hungry. It sounds crazy, but it works. We have used this with all three kids. Just make sure you listen to the DVD BEFORE you have the screaming baby as she soothes many kids over and over. There you have. My non-expert parenting tips that have worked for us. Good luck and get some sleep.